TAR Neo Air: The Neo Air has had a mixed press. I can imagine that if, having shelled out the asking price for a Neo Air, you find you've picked up one with a leak you'd feel pretty negative about the product. Especially if you discovered the leak in the field. 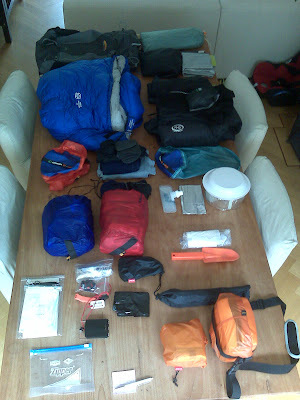 I have a similar feeling about Alpkit Airic mats. However, I can only call it as I find it. Mine worked perfectly, stayed fully inflated, insulated perfectly well for the conditions and ironed out the stony Rondane surface providing me with superbly comfortable nights sleep. It's got everything you could expect from a mat and provides a solution to the age-old paradox: no longer are optima for pack weight, pack volume and comfort mutually exclusive. It's the ultimate backpackers mat for three of the four seasons. Just how far it could be pushed into the fourth season I have no idea. I havn't used it enough to find its limit. In my humble opinion this mat is worth every penny. TAR should be congratulated for raising the bar. I wonder if their competitors can rise to the challenge? Just one comment about the Neo Air in use: the trick is not to over-inflate it! MLD eVent Alpine Bivvy: As far as I'm aware, at 360g, the lightest fully weather proof bivvy bag out there. Unfortunately, unless MLD still make them on request, it no longer seems to be available. I'm not sure what Rons reason is for pulling the product but my experience has been largely positive. It's served me well and seen me through several wet (one appallingly wet) night on two extended trips. Nevertheless its a mixed bag (if you'll excuse the pun). It functions well enough but, after some use I realise I prefer a top opening to a crocodile opening bag. I'm a side sleeper and I find it easier to arrange a breathing hole whilst maximising cover in a top opener. There's also a lot of zip on a crocodile opener and on the MLD the zip isn't covered with a storm flap. Although I've seam sealed everything in sight I wonder if the zip isn't a potential point of water ingress. That's the kind of thought that can keep you awake on a cold, dark, wet night! The two-layer eVent used by MLD, because the membrane is left exposed, may be less robust than it's three layer cousins. However, a bivvy bag is unlikely to experience the kind of punishment that shell garments do so I don't think this is a big issue. They say eVent is supremely breathable. I don't have any eVent shell garments so can't comment on how it compares to the Goretex fabrics in those clothing applications. Although bivvy bags present the hardest challenge for any breathable fabric (you're in there for hours at a stretch, you may be breathing into the bag and the bags most likely to be fully closed in the conditions least conducive to breathability), eVent seems to do a good job in this application. I've never experienced more than a very light layer of condensation on the top-side of my sleeping bag and only then when I've been forced to close up the bag. When all's said and done though, I would say my Goretex bags perform at least as well. I think eVent is a good choice of fabric for a bivvy but so is Goretex. I'm less positive about the ground sheet. The Alpine bivvy has a Silnylon base and this, in my experience, is the weakest link as far as moisture ingress is concerned. On a couple of occasions the foot end of my sleeping bag has been damp. I didn't understand this at first but now I'm convinced that the Silnylon has insufficient hydrostatic head to prevent ground water penetration when subject to the pressure of an elbow or knee or suchlike. I go to lengths to keep my sleeping bag away from the ground sheet using knee length mat and rucksack under my legs and feet. If I take care I stay dry. To this end I prefer to place my mat inside the bivvy bag. However, even though I went for the optional extra-wide size, the bag tapers such that thicker mats are a tight squeeze . I just get away with a Neo air short which stops at my knees. A longer air mat would squeeze the loft out of the bottom half of my sleeping bag. Having spent a lot of time in bivvy bags of one type or another I'm sure they add several degrees to the rating of a sleeping bag. I guess they keep wind at bay and, like a tent, they will trap some dead air around the occupant. It's hard to be sure but my feeling is that this is less true for the MLD bag than for my heavier three layer Goretex bags. I think the fabric is so much lighter and so much more supple that it readily conforms to the contours of a body and so traps less air. All in all the MLD Alpine Bivvy performs just well enough to keep finding it's way into my pack. If I was anticipating conditions significantly colder, windier, wetter on the ground than those I experienced in Rondane I would be tempted to pack a heavier bag. However, the Alpine Bivvy is just big enough, just weatherproof enough and just warm enough for me. It's just, by the skin of its teeth, good enough for what I do with it. Bivvys are supposed be be "just enough" though aren't they? If lightweight gear is about being just enough to do the job in hand and no more then MLD got have made a very good stab at a lightweight fully weatherproof bivvy bag. Golite Jam: This was another piece of kit that had a first run out in Rondane. I would normally be reluctant to field test a piece of kit so centrally important as a rucksack for the first time on such a trip but reviews of the Jam and the Pinnacle have been so universally positive, and my impression out of the box was so good, that I took a risk. Besides I was glad of the additional weight saving over my old pack (my Jam, a large, weighs in at 800g, 250g less than my Granite Gear Vapour Trail). Those who followed the trip report will already have a good idea of what I'm about to say. Since Rondane I've had mixed feelings about the pack. I like the bag very much but it won't be my weapon of choice for future trips where my start weight is over 10kg. For me the bag is close to perfect. It has exactly the right capacity for my set-up for four to five days unsupported. I really like the split between the main compartment and the large rear pocket. The latter, although putting significant weight in it risks shifting the centre of gravity too far from the back, is ideal for wet gear that you may need to access quickly. The Jam has converted me to hip belt pockets too. The ideal place for all those bits an pieces that otherwise get lumped together into ditty bags and little stuff sacks that rattle around in the main compartment of, inevitably lidless and access poor, lightweight packs. The fabric is convincingly rugged and should take a lot of punishment. Golite have refrained, on the 2009 model, from using those none-waterproof, waterproof zips that have been so popular of late opting instead for a boringly reliable weather flap. I can place and extract a water bottle in the side pockets while the pack is on my back. I even think the thing looks nice. In fact, the only thing I don't like about the bag is the compression system (the comPACKtor system) which, whilst effective for compromising the volume of the main sack also bends the back panel out of shape, but I can live with that one flaw. So, what's my problem with the carry? Simply put it just doesn't feel comfortable enough nor well balanced enough with a load of 12kg. I noticed, when packing prior to departure, that my load put a kink in the back pad. An extra layer of closed cell foam stuffed down the back panel was enough to solve the problem but I still wasn't happy that load was being adequately transferred to the hip belt. The Rondane trip, especially the more technical ground, confirmed this for me. I found my shoulders were doing too much of the work. I also missed top tension straps on the steeps. I realise that my opinion is at odds with others. Others, whose opinion I take very seriously, state maximum loads of 12 and 15kg for the Jam. I can't explain the discrepancy, perhaps it's my physiology, perhaps I've not mastered packing the Jam, I don't know. What I do know is that, on the third long day, the big pull over the endless boulder fields of Rondslottet and Vinjeronden, the pack was transformed into the best rucksack I'd ever thrown onto my back. That transformation was already well underway in the Langholet when I estimate I started the day with 10kg all-up. My final conclusion is that, although there is much good about this pack (miraculously much for the price!) the weight saving and the convenience of the bag aren't enough to balance the equation in favour of the Jam. The Jam will get a run out again for shorter trips. If I ever loose another 2kg from my base weight (now running at around 5kg) it would be my first choice but that's unlikely to happen. Until then, the Granite Gear Vapour trail, with all its flaws (single compartment, lack of hip pockets, inaccessible side pockets, over-long roll top etc) will remain my pack of choice for big trips. A rucksacks primary function is to carry the load and the Vapour Trail simply does that better. At least on my back it does. Cumulus Quantum 200: This is my first quality down bag. It's accompanied me on three big trips now. At 568g (manufacturer claims 495g) it's very light for a bag rated to 0 degrees. Whilst, for me, the rating is optimistic I do think it's miraculously warm given the weight of down used. Just 200g of Polands finest 870 fill goose down gets me down to around 2 degrees before I need to reach for my down jacket (see following). To be fair, Cumulus do state that their ratings assume use in a "typically sized 1-3 man tent" and I think the dead air in a tent may well account for the difference I experience. My bivvy bag or bivvy bag/tarp combination will certainly be colder. It's a well featured bag for its weight: full zip, neck warmer (a sort of simplified baffle), box wall construction, little internal goodies pocket. Cumulus havn't cut out features to save weight though in the case of the 200 they have arguably skimped on the size . It's recommended for people up to 185cm (6'1") and being, coincidentally, 185cm myself I can confirm that taller people need not apply. Those who don't like tight fitting bags are not going to be too impressed either. In Rondane, as in the Alps the year before, I found my lower limit when using this bag. Though in Rondane temperatures weren't very low on two of the three nights I lay exposed and the wind blew. I was glad of the extra down in my jacket. I see my jacket as part of my sleeping system and I learned a nice trick in Rondane. Instead of waking up cold in the middle of the night and having to dig out my jacket I started each night with my jacket on and my bag pushed down around my waste. As the temperature dropped I just reached down and pulled up my bag. I've toyed with the idea of switching to a quilt or a top bag but the truth is this system fits my needs well and, unless the opportunity of a winter trip rears its head, I won't be spending anymore money on sleeping bags of any kind. Not unless I see something in the PHD sale at least. PHD Ultra down pullover: Rondane was the first time out for this bit of kit. I loved it from the off. At 295g (without the hood) it's madly warm for it's weight. 295g is much heavier than the stated weight of 230g but that's, at least in part, my own fault. I had PHD knock one up in Dryshell. I suppose that means it could equally well be described as a Minimus with 900 fill down? Whatever, it's become my insulating layer of choice and the extra warmth over my Montbell down inner together with the peace of mind afforded by dryshell is well worth the extra 85g . I only experience one problem with this piece of clothing: the elasticated waste doesn't cinch up tightly enough for my liking. This seems to be a recurring theme with my down layers. I think the jacket would perform even better with a tighter fitting waste. That's, one more gear mod on the list for the long, grey, Dutch winter.